December 18, 2014 The saying "make your mark" means to change the world in a certain way (hopefully in a good way) so that others can see what you've done. Taking that literally, we've decided to test out a local makerspace's 3D printing services and print out a 3D stamp of our Progress Thailand logo. In all from our designing it in 3D using SketchUp, to having it printed out and in our hand, it took less than a day. The 100mm wide stamp took 42 minutes to actually print out. 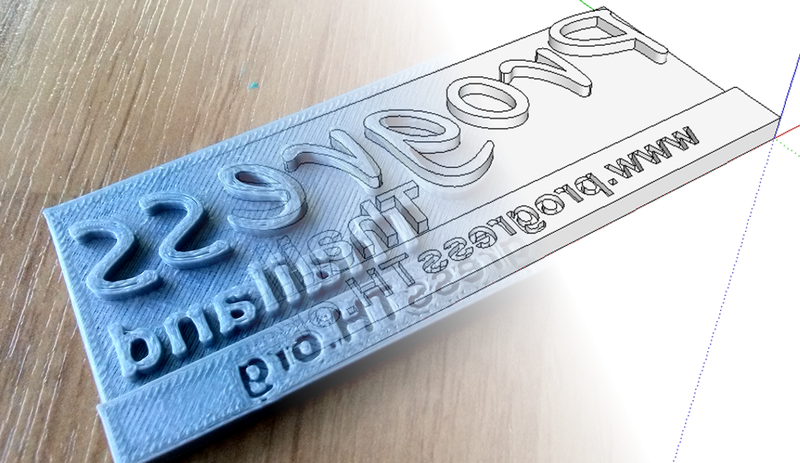 This powerful technology to prototype and make things designed in 3D has almost limitless possibilities. If one were to visit Fortune IT Mall on the 4th floor and look at Gravitech's Home of Maker, they would see many objects in their store and makerspace printed out in 3D from their business card holders to brackets holding up equipment in their storefront. What possibilities does this technology hold for regular people and solving local problems technologically? Many project cases at Home of Maker, or the other growing makerspace in Bangkok, Maker Zoo, are 3D printed. Perhaps in the near future, urban agricultural projects revolving around automation will use this technology as well making development astronomically cheaper. Think about it, what if you had a project now and needed a custom housing for it? Or a custom-made part? Where would you go and who would make "just one" for you? 3D printing and other forms of automated manufacturing that have been making their way into makerspaces and even individual working spaces help answer that in an accessible way.